On Tuesday the 27th of September at the 26th session of the UN Human Rights Council, the International Movement Against All Forms of Discrimination and Racism (IMADR), jointly with Franciscans International, Minority Rights Group International (MRG) and Human Rights Watch (HRW), held a side event titled “Universal Periodic Review of Sri Lanka”. The event was moderated by Mr J. David Whaley, Former UN Resident Coordinator. Three civil society representatives from Sri Lanka formed the panel: Dr. Nimalka Fernando, Mr. Prasanna Kuruppu and Mr. Freddy Gamage. Opening the event, Mr. Whaley reminded the audience that Sri Lanka will be reviewed in November 2017 by the Universal Periodic Review (UPR). He also noted the two-sided relationship between Sri Lanka and the Human Rights Council (HRC); one side has the normal relationships between all countries and mechanisms of the HRC through the acceptance of international norms and conventions, and the second side details the specific Sri Lankan process within the HRC through the Resolutions 30/1 and 34/1. Dr. Nimalka Fernando welcomed the panel and mentioned the report that was prepared for the UPR by the Centre for Policy Alternatives (CPA) along with 50 other organisations. 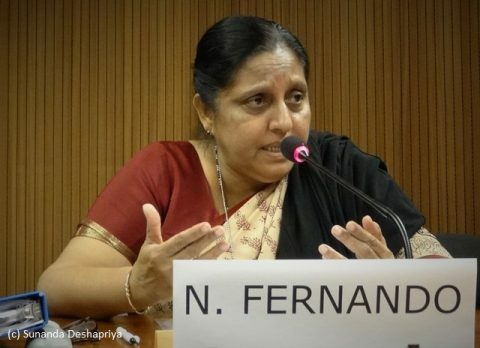 Despite the utility of the UPR, she noted certain weaknesses, mainly that the Sri Lankan Government accepts recommendations but fails to comply with them. Sri Lanka suffered through a war marked by grave violations of human rights, which led to destabilisation of the rule of law and the culture of impunity. Through advocacy, the UPR became a strong tool to keep the issues of accountability, human rights and reconciliation, and grave violations before the UN and the HRC. Now, coming into the next phase of the UPR the political context has changed. Resolution 30/1 was adopted by the HRC, cosponsored by Sri Lanka, and challenges the political leadership to promote a dynamic transitional justice process. The third UPR cycle will focus on the relevance of this process. Dr. Fernando called for the restoration of independent commissions and judiciary. She states that the international promises must be absorbed into the UPR to prevent them from running on parallel tracks – accountability must be related to civil, political, economic, social and cultural rights. Although the current President signed the Office on Missing Persons (OMP) Bill she lamented the slow progress of this body, which causes a loss of confidence of the affected communities with regard to relief and justice. She congratulated the disability organisations that attended the event, as it is the first time that a Sri Lankan disability organisation has come to the HRC. She stated that “I’m not afraid to go back to Sri Lanka like I was in 2008, there are no white vans.” However, she was concerned by the unfortunate rise of extreme Buddhist rhetoric and attacks against Muslims. She believes that it is up to civil society to promote and continue with its critique of governance and to create the frameworks to make the reforms possible. Mr. Whaley pointed out that Resolution 30/1 and the UPR are not only related but must be integrated throughout the UPR. The Resolution and the UPR face similar challenges of weak implementation of the pledges, commitments and obligations undertaken by the government. A representative from the Centre for Policy Alternatives, Dr. Saravanamuttu Paikiasothy, stated that the process of transitional justice has made some advances but it is still insufficient to fulfil the commitments made by the Government. The country has attempted constitutional reforms and a report was submitted to the Government by the steering committee, however, there has been no consensus on the structure of the state or how elections will be conducted. Dr Paikiasothy pointed out that nominations for the OMP are still pending. The right staffing and appropriate funding are essential to ensure an operational office. Additionally, an effective communication strategy on the part of the Government is required to inform the population about the Government’s motives and agenda. Without it, the agenda can be instrumentalised by the opposition, which can use this opportunity to misinform the population. He stated that a timeline of constitutional reforms and for the implementation of the three mechanisms stated in Resolution 30/1 should be included in this communication plan. Mr. Prasanna Kuruppu is a representative from the Disability Organisations Joint Front (DOJF), an umbrella organization of thirty organizations located in Sri Lanka. Created in 2001, the DOJF represents all forms of disabilities and aims to draft a national bill ensuring the rights of disabled people. The organization also submitted a report to the UPR stating that it must be a priority to include disabled people as this group has been excluded from the two previous UPR cycles. The organization focuses on all aspects, including access to health, education, habitation and rehabilitation. Mr. Kuruppu stated that 20.3% of children are excluded from primary education and 70.9% of persons of employment age who have a disability do not engage in economic activities. Regarding civil and political rights, Mr. Kuruppu stated that persons with disabilities face discrimination both in law and in the judiciary. Access to information for disabled people is severely hindered due to the absence of alternative communication. DJOF therefore recommends that Sri Lanka implement the Convention on the Rights to Persons with Disabilities (CRPD) by drafting a comprehensive rights bill with special focus on Article 3, 4 & 33. The Government should also repeal and review laws that prevent the inclusion of persons with disabilities. Political willingness and an increased budget are prerequisites to ensure the integration of persons with disabilities. 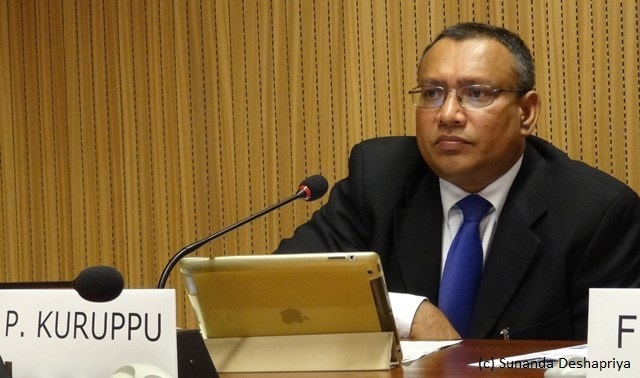 The representative for Action Committee for Media Freedom, Mr. Freddy Gamage, stated that in the past two years, the country has opened to Special Procedures including the Working Group on enforced disappearances and the Special Rapporteurs on torture, minority issues and counter-terrorism. Three more visits have been scheduled to Sri Lanka: the Special Rapporteur on transitional justice, the Working Group on arbitrary detention and the Special Rapporteurs on freedom of expression. 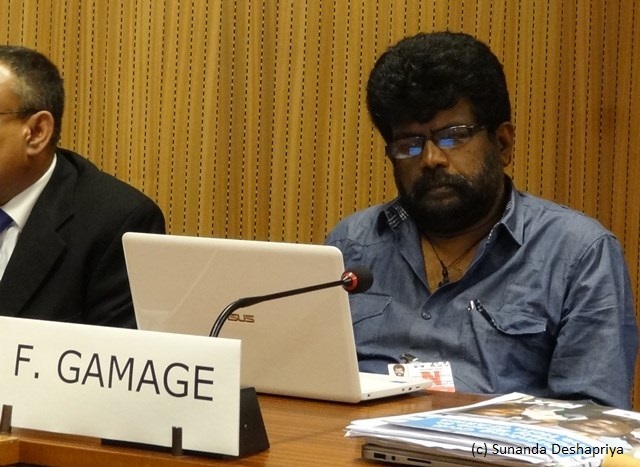 Mr Gamage stated that journalists now enjoy broader freedom of expression, however, threats and intimidation continue. Tamil journalists receive letters in Sinhalese from the police and can be arrested. The governance system of the security forces has to be reformed to ensure broader freedom of expression. M. Gamage reminded the audience of the case of Subramaniam Ramachandran who was disappeared after writing an article on illegal sand mining involving corporations and military personnel. It has been ten years since he was disappeared and no information has been given to his family. As of today, 44 journalists have been murdered or disappeared, 41 are Tamils. He recalled his own story of being attacked after he wrote an article on the links between the mafia and the vice-mayor of Negombo. In June 2016, Mr. Gamage had gone to cover a meeting and was returning to his car when he was attacked. He was hit on the head with a tree branch and had to spend multiple days in hospital. This incident happened in broad daylight. The vice-mayor “threatened me over the phone saying I should not write bad things on them only good things, then the attack came one week after”. The attackers were arrested within 48 hours but Mr. Gamage stated that if this incident had happened in the previous regime the attackers would never have been arrested. Even now, 15 months after the attack, the vice-mayor has not been arrested. The next hearing is in January and it will act as a litmus test of good governance to show the Government’s willingness to make a change. Ms. Rasanjali Wadduwa Pathirage, also a member of DJOF, reminded the audience that out of the disabled people in Sri Lanka, 57% of them are women. These women face triple oppression – oppression of patriarchy, class, and disability. She stated that University admissions of Sri Lankan women today are 62%, but compared with disabled women, the admission rate is less than 1%. As a result of poverty, lack of access and lack of accessibility to public transport, these women have to rely on their families, who are also poor. Ms. Pathirage stated that it is essential to raise the issue of discrimination and sexual violence that women face, both in the home and at the workplace, especially when the women are deaf or mentally disabled. She told the audience that when a woman faces sexual violence as a result of a lack of sign language, it is very difficult for them to make a complaint in the police station. No response system has been put in place for these women so they must suffer in silence. Sri Lanka has discussed increasing women’s political participation by 25% in political processes and Government bodies, Ms. Pathirage stressed that it is essential that disabled women be represented. The National Women’s Committee currently has no disabled representation. She hopes that in the future disabled women’s’ representation will be increased at the decision-making level in Sri Lanka. In the interactive discussion, hope was expressed at the progress that has been made and questions were put to the panellists about the form of this progress and what new bodies, like the OMP, could do. Dr Fernando stated that civil society wanted the OMP to have a broader mandate but hoped that a judicial function would soon be set up with transitional accountability measures. Another question focused on the legal measures that could be taken in regard to missing persons and asked about the lists of surrenders, detainees and those that were released. Dr. Fernando reminded the audience that the president promised to release a list of surrenders last month. Civil society is waiting to see that this “talk of reconciliation is not just rhetoric”. A third question focused on constitutional reform and whether it would be possible to complete the reform in the current legislative period. Dr. Fernando stated that civil society was gravely concerned at some of the compromises that were reached in the Constitution but hoped that the people would decide the new Constitution. A member of Franciscans International asked Mr. Gamage about the Government’s response to the missing journalists. Mr. Gamage stated that the Government has agreed to pay compensation to the families of the murdered journalists, but no prosecutions have been undertaken. The final question focused on disaggregated data for Sri Lanka, especially in the context of disabled persons. Mr. Kuruppu expressed activists’ displeasure over this information-gathering by the Sri Lankan Government as the Washington Group questionnaire for disability contained only seven questions, omitting most categories of disabilities. Dr. Fernando added that there is currently no plan for rehabilitation for the war-affected in the North and East. She stated that laws need to be reviewed, policies need to be put in place, and the Government needs to immediately institute a census. In conclusion, Mr. Whaley stated that he hopes that the Government report and the attentive ears of the council will do justice to the search for human rights improvements of Sri Lanka when it comes to the UPR.